Every detail of the Bacon Pro was meticulously engineered to provide you with the best bacon cooker ever made. An 11” diameter and 6” tall design maximizes the available cooking space inside a microwave oven. 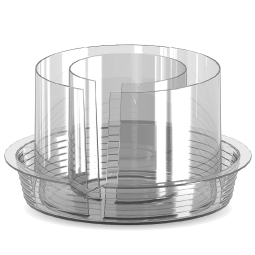 The grease collection dish 2" side-wall eliminates spills. 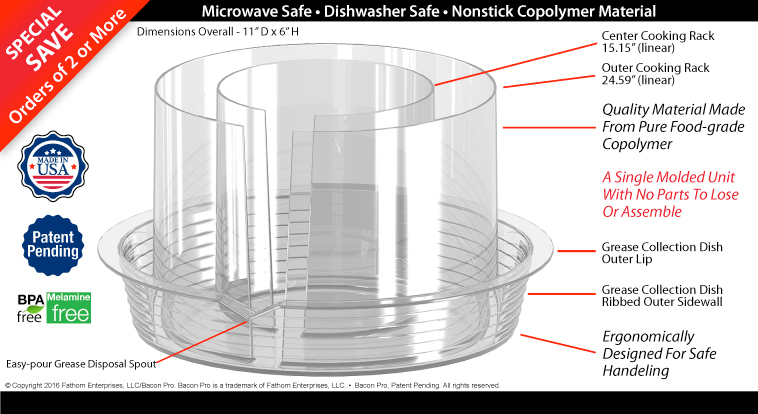 It is ribbed and ergonomically designed for safe and secure handling in and out of the microwave oven. It is a molded unit with no parts to lose or assemble. Cooking space of 451 square inches is double any other bacon cooking device. With a Bacon Pro you can cook 23 slices of perfectly crisp bacon in just minutes. The material has exceptional heat and chemical resistant qualities to withstand temperatures of 400°F and it is impervious to the unique mineral and acidic characteristics found in bacon drippings. The material's unique non-polar molecular structure makes it virtually transparent to microwaves. That means the microwaves will pass through the bacon cooker with no resistance to cook bacon at maximum efficiency. It is BPA, melamine, and halogen free. It's dishwasher-safe in the lower rack, and you'll never have to scrub to clean this cookware because the bacon particles will just flush away with a quick rinse. After using our cookware, we believe you'll agree; it is the best bacon cooker since the iron skillet. It is the ultimate gift for anyone who likes bacon. Watch the "How It Works Video" below and see for yourself.